Ukraine is among only 14 countries in the WHO European Region where measles and rubella remain endemic. 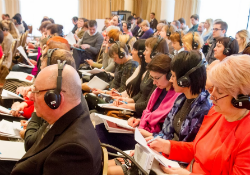 With WHO support, health authorities in the country organized a national conference on measles and rubella elimination on 21–22 February 2017 in Kyiv. Aiming to review control efforts in Ukraine within the context of the regional measles and rubella elimination goal established in the European Vaccine Action Plan 2015–2020, the conference brought together the leadership of the Ministry of Health, representatives of the National Medical University, national experts on public health and immunization, specialists from the country’s regions and experts from WHO/Europe. The participants expressed concern about countrywide gaps in immunization, disease surveillance and reporting. In 2015 Ukraine reported only 56% coverage with the first dose of measles, mumps and rubella (MMR) vaccine and 57% with the required second dose. The country has also faced problems in implementing surveillance for measles, rubella and congenital rubella syndrome, including suboptimal case detection, low laboratory investigation rates and no genotyping in 2015. During the conference participants were encouraged to start work on key national documents, including a comprehensive national action plan for measles/rubella elimination, and to prepare the annual status update on measles and rubella for 2016. This status update should be submitted by every Member State in the European Region to the Regional Verification Commission for Measles and Rubella Elimination, which assesses national and regional progress towards the elimination goal. Requirements for the elimination verification process were discussed and detailed recommendations for immediate government action were developed. In the context of ongoing health care reform in Ukraine, WHO support focuses on the development of national and subnational capacities and strengthening of the independent national immunization technical advisory group, to ensure that the Ukrainian government receives reliable evidence-based recommendations. National and subnational stakeholders also discussed the best approach to collect data in support of evidence-based decision-making related to immunization. In particular, the current practice of conducting routine serological surveys was discussed. Based on cost–effectiveness and methodological considerations, as well as the low vaccine coverage rates in the country, it was agreed that emphasis should instead be placed on disease surveillance and the introduction of case-based surveillance for rubella and congenital rubella syndrome. A special session was also organized to bring together the National Verification Committee for Measles and Rubella Elimination, the National Certification Commission for Polio Eradication and WHO to discuss immunization challenges and agree on next steps. Recommendations from the national conference will be communicated by the National Verification Committee to the Ministry of Health, along with a request for high-level support for finalization and approval of the national action plan.